Slovak cloud platform TULIP extends its time & attendance management system for a new module ‘Shift plan’. Now available, for retail, manufacturing and gastro companies, we bring you a new sophisticated tool for attendance management of their employees. The online shift plan is a completely new feature for the CEE region. “Yes, many time & attendance management systems have a shift plan, but almost none are in the cloud. Employees are usually forced to install some software onto their computers. With TULIP, they will just get an access name and password for a web portal and can immediately start working with the system. No additional applications, software or hardware are required“, says Viktor Mečiar, TULIP Solutions´ managing director. The system works via pre-defined calendars. ”We set up different calendars based on the agreement with the client. Every calendar has parameters like its cycle´s length, shift regime or weekly fond. 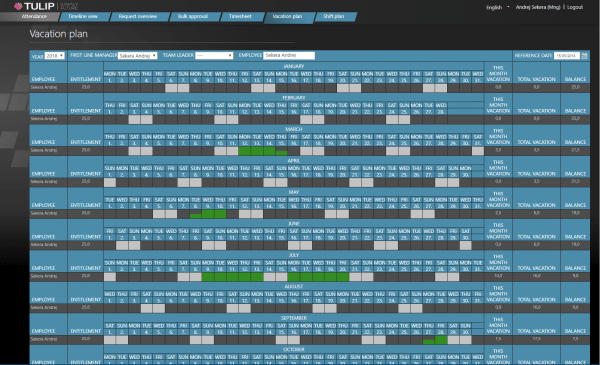 The System automatically generates a shift plan for an employee based on the selected calendar. A shift plan can be manually updated. Of course, everything must follow the legislation and our system provides an automatic check,” Viktor Mečiar says. 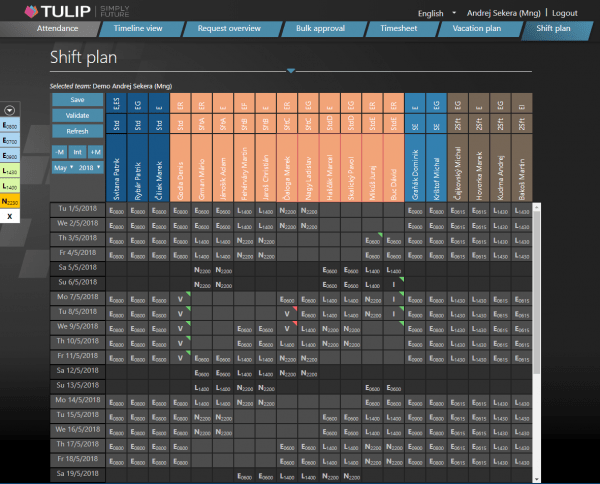 The shift plan in TULIP also provides other functions which elegantly control employees´ work organization. The shift manager can “tag” other employees and filter them via these tags (tags are also created by the manager). The manager can additionally assign subordinates to different teams. Everything is simply selected by colours, so using TULIP can still be friendly and intuitive, even in this sophisticated version. TULIP also provides simple negative attendance management (absence management). It can be connected to the payroll software and export data for payroll processing. TULIP does not provide any hardware devices; therefore you cannot track employees’ attendance via cards or biometry. TULIP Solutions has been developing the online platform since 2012, and today it is used by more than 550 companies spread over 16 countries in the world. Are you interested in TULIP time & attendance management system?